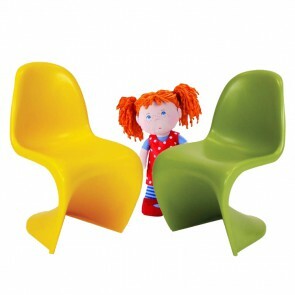 Kids design chair and design tables inspired on designers like Charles Eames and Verner Panton. The presented design chairs are reproductions of high quality. Overall I'm happy with my purchase. But I will note that the estimated shipping time - shown prior to making my purchase - was doubled once I'd actually made my purchase: it went from one week to two weeks after I'd completed the order.The other thing has to do with the item itself. I bought it at a reduced price from their "discounted" area. The website had very close photos of the defects - which were the reason that it was on sale - which were all very small, but there were additional (and different) defects that weren't mentioned. As these items are "final sale" I didn't make a fuss, but if you're considering one of these "flawed" items, you should be aware that they might be more flawed than you thought. So, in summary: the shipping might take longer than you thought (packing was excellent though) and you're rolling the dice with the sale items. But yes - the price was GREAT and I'm glad I made the purchase. I WOULD USE THEM AGAIN WITH HESITATION. Good prices, speedy delivery, excellent service. There was a small mixup in our order and Dominidesign just sent us the part we needed free of charge. Would recommend and shop here again!